Ethambutol has long been part of the standard therapy for tuberculosis. LMU researchers now describe how the antibiotic acts on the bacterium that causes the disease: It specifically inhibits growth of the cell wall from the cell poles. Tuberculosis, which is caused by Mycobacterium tuberculosis, remains one of the ten most frequent causes of premature death worldwide. Every year, approximately 1.5 million people succumb to the bacterial infection, which primarily affects the lungs. Effective treatment of tuberculosis requires adherence to a demanding therapeutic regime over a long period. Thus patients must regularly take a combination of as many as four antibiotics for up to four months. One of these first-line drugs is ethambutol. Although the compound has been in use for many years, the mechanism underlying its effects on mycobacterial growth has remained unclear. Now a research team led by Marc Bramkamp, a microbiology professor at LMU, has carried out a detailed investigation of the drug’s mode of action, using super-resolution microscopy to visualize the impact of the antibiotic on cells. It was already known that ethambutol interferes with the formation of the mycobacterial cell wall. The antibiotic has a bacteriostatic effect, i.e., it inhibits proliferation of the pathogen but does not actually kill it. M. tuberculosis belongs to a group of bacteria that is largely made up of harmless species, but includes the microorganisms that cause leprosy and diphtheria. Mycobacteria are characterized by the unusually complex structure of their cell walls. In addition to the core layer of peptidoglycan found in all bacteria, which is composed of a complex network of specialized sugars and unconventional amino acids, mycobacteria possess two further coats -- an intermediate arabinogalactan layer made of a polymer comprised mainly of the sugars galactose and arabinose, and a thick, rubber-like outermost layer of lipids which makes the cell wall extremely difficult to disrupt. Mycobacterial cells are rod-shaped and grow apically from each end of the rod. Working with a non-pathogenic relative of the tuberculosis bacterium, the LMU researchers show that, under normal growth conditions, two distinct biosynthetic complexes are required for the construction of the cell wall. One set of enzymes is responsible for assembly of the two outer layers, and the LMU team demonstrated that ethambutol specifically interferes with this process by preventing the linkage of arabinose molecules into a more elaborate network. As a result of their inability to construct an intact arabinogalactan layer, cells exposed to ethambutol also lack the outer lipid layer. The other cell-wall complex is activated only in the center of the cell, where the plane of cell division is located. Bramkamp and his colleagues demonstrate that this machinery is responsible for synthesis of the inner peptidoglycan coat. This process is not affected by ethambutol, but it can be inhibited by beta-lactam antibiotics, to which the penicillins belong. 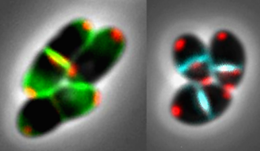 In accordance with this division of labor, ethambutol turns out to have a striking impact on cell morphology: With each succeeding cell division, the long axis of the rod-like cells progressively shrinks, and the cells eventually become spherical in shape. In Bramkamp’s view, this phenomenon provides a particularly strong argument for a careful re-evaluation of the standard anti-mycobacterial agents. For it confirms that exposure to antibiotics can induce cells to enter what is called the stationary phase -- a metabolically dormant state in which cells are resistant to the action of antibiotics, which inhibit processes that are essential only in actively growing cells. “The use of ethambutol on its own would cause the pathogen to enter a state that allows it to persist in tissues and that is certainly not a desirable outcome,” Bramkamp warns. However, antibiotics that interfere with peptidoglycan synthesis complement and enhance the effects of ethambutol. Based on their new findings, the LMU researchers hope that the cell division machinery will serve as a further point of attack for new antibiotics.